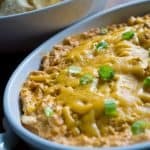 This easy Buffalo Chicken Dip has all the flavor and spice of Buffalo Chicken Wings in dip form-a favorite tailgating or football party appetizer! In a large bowl mix cream cheese, hot sauce, ranch and chicken until thoroughly blended. Pour mixture into a baking dish and bake for 10 minutes. Remove from oven, top with cheddar cheese and bake another 10 minutes or until cheese is melted and bubbling.